Ok, I have been a lover of Henna [or Mehndi as I know it] since childhood. I was always fascinated by the beautiful bridal colours and designs as I grew up. Like most new users I always found it hard to get a great ‘Bollywood’ colour out of my Henna but over the years have picked up a few tricks that should help you get the best colour out of your henna and stain darker. To start with, its best applied when your warm, I don’t mean hot and sweaty – but warm. I find it stains less on cold skin. You do not want a barrier [like lotion/moisturisers] coming between your skin and henna, so wash the area well with soap and warm water, then dry well before applying. You will find it initially dries out within 20 mins, but the ‘trick’ is to rehydrate it with ‘sugar water’. This is 50/50 sugar and warm water mixed together and dabbed on with a cotton bud or ball. Just gently dab a little over the drying henna design and it will moisten and start to release more colour. The sugar’s there to help the paste ‘stick’ a little better. You want to keep the henna moist so repeat if required to squeeze the most out of your henna. 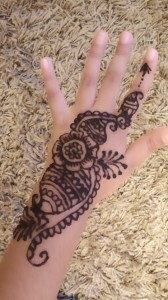 Also make sure you do it before it dries out to much, as henna will dry, crack and fall off. When you are ready [or have had enough! ], you can wash off the dried henna and apply an oil like olive oil gently on the design area – I find clove oil very good for this. Any washing of the design will start to fade the colour, so I sometimes skip this part and instead just peel off any dried flaking bits of henna and apply the clove oil without any washing. Small tips that should give you better Henna colour, Good Luck!